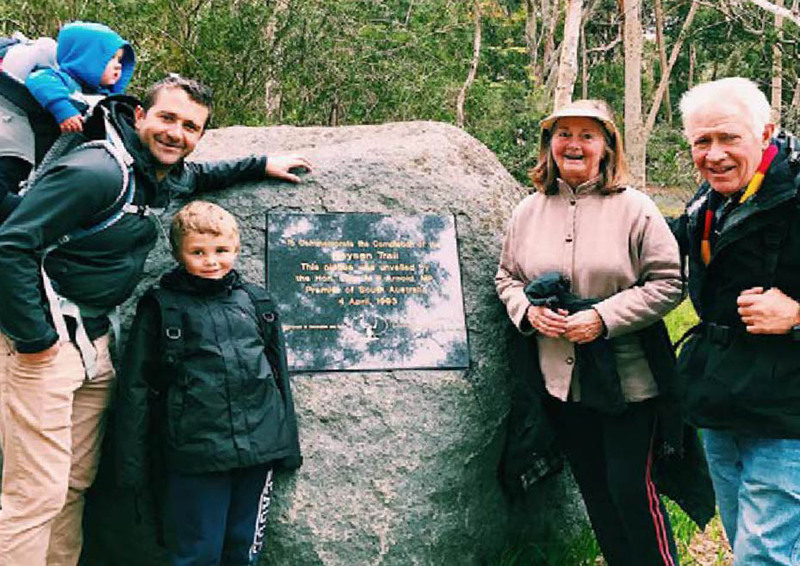 Amelia Veale writes of her family’s tradition of walking the Heysen Trail as a child and now as a parent with her children. A hiking chant: ‘Left, left, I left my wife in New Orleans with 45 cents and a can of beans, I thought it was right, right, right for my country whoops-ee-do!’ I’m not sure when or from whom I learnt this walking ditty, but I clearly remember many of my childhood hikes chanting this with my brother and sister, accompanying the ‘whoops-ee-do’ with a double-hop-step! To this day, when I set out on the trail, at some point the chant still sneaks into my consciousness! 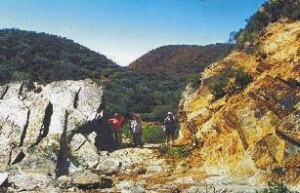 Since childhood, walking and overnight treks have been a consistent family activity. 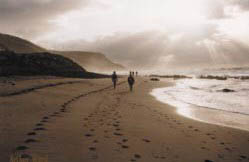 Together we have covered much of the Heysen Trail; we have hiked in Tasmania and even New Zealand’s Milford Sound. I was a reluctant walker when I first started walking the Heysen Trail as a child. I preferred reading books and making craft. 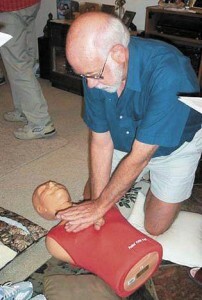 But, spearheaded by my Dad, my family was an active one whether we liked it or not! By the time I was in high school, however, I had well and truly caught the activity bug and to this day I am still a keen walker. 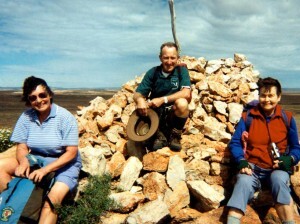 Some of my most poignant childhood memories are of walking the Heysen Trail. Joined by extended family or friends we would set off with backpacks and scroggin in our side pockets. There was always some misadventure or another, some as minor as blisters and sore feet, and others more dramatic such as torrential rain that flooded our tents. Yet through it all, even though I didn’t know it at the time, I was building character, resilience and the appreciation for an active life. At the same time sharing these special experiences with my family. I am a stronger, healthier person today because of this regular time spent hiking during my childhood, youth and early adult years. With the ever increasing rates of obesity and depression within our community and, most alarmingly, within our children, I now see how incredibly lucky I was to have had the regular inclusion of hiking and physical activity in my upbringing. I sincerely believe that if more children were encouraged to get outside, get active and get off their screens, that not only obesity but other issues such as depression, lack of motivation and direction would be reduced. This is a view shared by my husband and something we are very conscious of as parents. So last year we started walking the Heysen Trail as a family again, but this time with children of my own. Our aim is to cover it from end to end but with our youngest just under two years old, we’re not looking to do it quickly. Yet the great thing about the trail is we don’t need to try and tackle it all at once. There are so many wonderful sections that we can tick off, bit by bit, starting with the easier sections. We’ve started doing short walks close to home, then we’ll build up to longer trips. We also have walked a few short sections through Kuipto Forest where we were able to take the pram along on some sections. This gave my husband a break from carrying our youngest son who is getting heavier! One of my favourite sections was the boggy bits. The others squelched into the mud probably because you’re bigger. But me, I got through easier and was dancing around waiting at the end of the bog. I am very thankful for the wonderful privilege our family has in freely accessing this incredible resource, which is carefully maintained by many wonderful volunteers. I strongly encourage others to do the same. Get outside, share time with your loved ones – surrounded by nature – there is magic in this. As a Mum, I know it is right, right, right for my family. Whoops-ee-do! 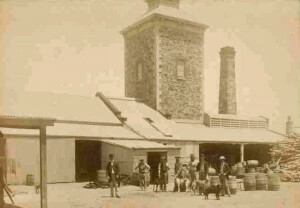 Amelia Veale lives in the Adelaide Hills with her husband, two children, their dog, four chickens and three sheep. Amelia is a member of the Friends of the Heysen Trail Marketing & Membership Committee, a passionate storyteller and CEO of Narrative Marketing where she develops strategic marketing solutions for clients, and investigates storytelling in business through her podcast Be The Drop. 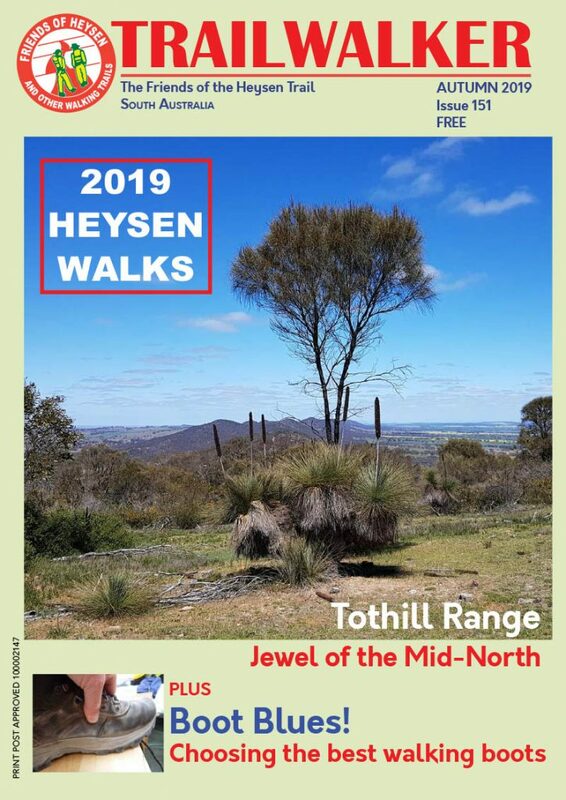 No, I would never walk the whole Heysen Trail! Think of all those long boring road sections! Yes, I had said that several times. So how is it that I have just completed the very last step of the 1200km Trail? 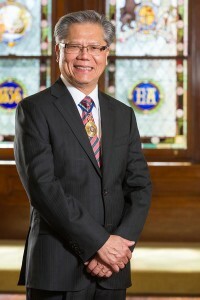 The Friends of the Heysen Trail is privileged to have His Excellency as Patron of our association and we look forward to an opportunity to meet with him during his term. After completing the Heysen Trail a group of eight walkers continued beyond Parachilna Gorge. 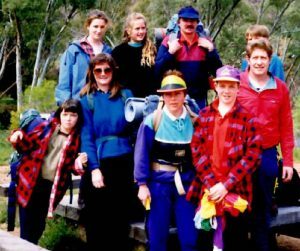 We walked through the upper Flinders along Warrawena, Hamilton Creek to Terrapina water hole, climbed over Mt Babbage, across the Stony Dessert plains to Mt Hopeless. 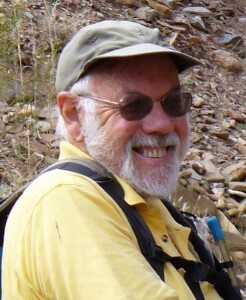 David has contributed greatly to the activities of the Friends. After joining he quickly became a Walk Leader and a Council Member, a role he continues in to this time. The plan was simple enough. 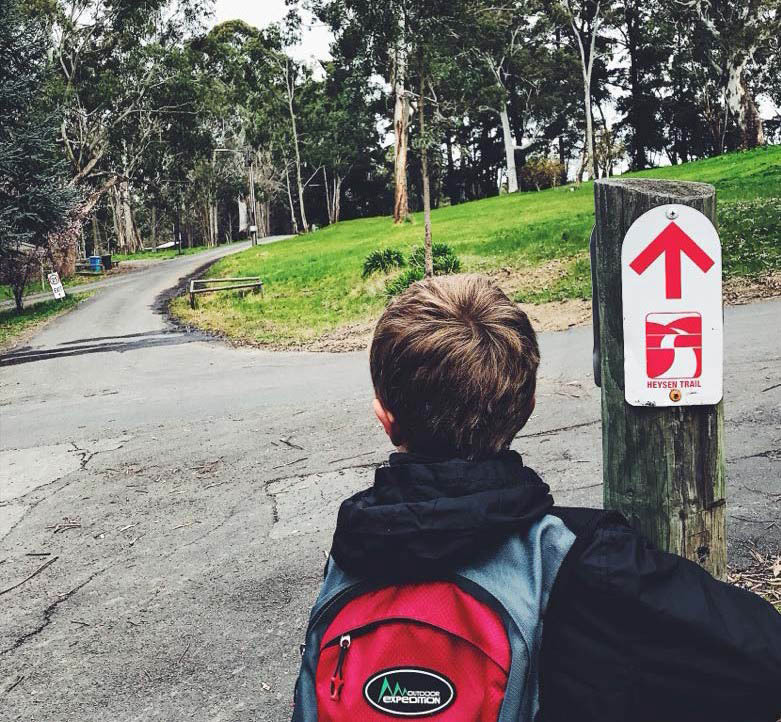 Check out a circuit at Deep Creek for the purpose of printing a map showing all the relevant features to enable anyone to be able to do the walk. Simple plans have this strange habit of not remaining true to form.